PepsiCo have today unveiled a social vending machine that features digital / social vending technology that will enable consumers to better connect with Pepsi brands at the point of purchase. The Pepsi social vending system enables any user to send a gift to a friend by selecting a drink and entering the recipient's name, mobile number and a personalized text message. Gifts can be further personalised with a short video recorded right at the machine and the gift is delivered with a system code and instructions to redeem it at any Pepsi social vending machine. When the recipient redeems their gift, they're given the option of either thanking the original sender with a gift of their own or forwarding it to another friend. 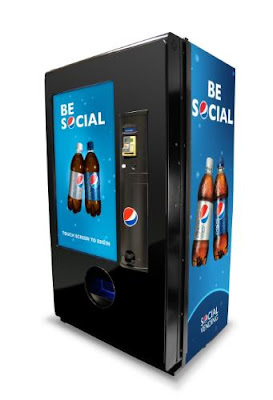 The Pepsi social vending machine also has an innovative feature that enables "Random Acts of Refreshment" - the ability to buy a drink for a complete stranger through any other Social Vending system! The prototype of the Pepsi social vending machine will be shown at the National Automatic Merchandising Association's One Show in Chicago between April 27-29 2011. Another interesting example about how digital / social is weaving its way into society and enhancing every day products. This is a pretty cool concept..gotta wonder though, in an area where there's communications issues if these machines are still going to work... I recently saw that headline but hadn't read the full article.